Come join us at the studio for our very first Children’s Craft Night! This event will be a Foil Line Painting Class! This is a fun and easy craft for children of any age to participate in. The adults will love it too!! This craft is created using aluminum foil, sharpies, and yarn! 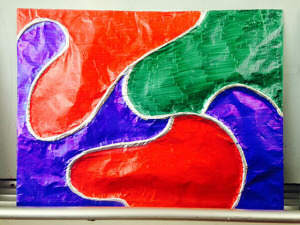 Foil Line Paintings are a great way to express some creativity and try something new! Create a unique piece and take it home to display on your fridge for everyone to see! This event will be $10/person.